This Vintage Snap Cap is predominately a dark "new" denim blue with hints of red, gold, grey and slightest smidge of green. Works great to dress you up, but couldn't be more perfect when matched with one of our Donegal Vests and your favorite pair of jeans. 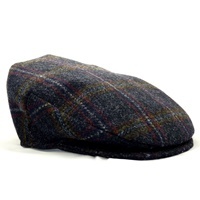 Handcrafted by Hanna Hats of Donegal Town in Ireland.